Finalist for 2009 AATSEEL Award for Best Book in Literary/Cultural Studies. The defining quality of Russian literature, for most critics, is its ethical seriousness expressed through formal originality. The Trace of Judaism addresses this characteristic through the thought of the Lithuanian-born Franco-Jewish philosopher Emmanuel Levinas. Steeped in the Russian classics from an early age, Levinas drew significantly from Dostoevsky in his ethical thought. One can profitably read Russian literature through Levinas, and vice versa. Vinokur links new readings of Fyodor Dostoevsky, Isaac Babel, and Osip Mandelstam to the work of Levinas, to ask: How does Judaism haunt Russian literature? In what ways is Levinas' ethics as "Russian" as it is arguably "Jewish"? And more broadly, how do ethics and aesthetics inflect each other? Vinokur considers how the encounter with the other invokes responsibilities ethical and aesthetic, and shows how the volatile relationship between ethics and aesthetics--much like the connection between the Russian and Jewish traditions--may be inextricably symbiotic. In an ambitious work that illuminates the writings of all of these authors, Vinokur pursues the implications of this reading for our understanding of the function of literature--its unique status as a sphere in which an ethical vision such as that of Levinas becomes comprehensible. THE WORLD WANTS TO BE SEEN. It demands one's attention and response. This is an ethical demand and an aesthetic one. Nearly every artistic or literary manifesto claims to offer an aesthetic sensibility that will better "do justice" to the world. Wittgenstein's cryptic assertion that "ethics and aesthetics are one and the same" feels strangely intuitive either because it must be true or because we need it to be true.1 But aesthetic perception has its limits; it can be reductive or essentialist, turning the other into more of the same. Then again, is it fair to ask literature or art generally--a human activity that nudges us beyond things mundane--to attend to this demanding world? After all, art in its otherworldliness not only reflects this world but discloses it--while being part of this world, another of its demanding constituents. All of which demands an "ethical criticism" that can address art without consigning creative works to the realm of philosophical illustration or anthropological corrective, and even more importantly, without suppressing the autonomous instincts that animate the best kinds of aesthetic activity. Unfortunately, the entire project of social criticism--in all its manifold richness, from Chernyshevsky to Foucault--does not satisfy this demand. On the one hand it offers too much--a system that accounts for the human condition, literary and otherwise, whether or not anyone needs such an accounting. On the other hand, in its tendency to overlook the strangeness of aesthetic detail, social criticism offers too little. of truth. It is as if there was a supplementary enrichment, an increase. The investment in Russian authors by Jews of East European origin has always been especially striking. Beyond the historical circumstances of such an investment, the Russian and Jewish traditions share certain preoccupations. I believe these shared preoccupations are meaningful in ways that go beyond historical contingency. Both traditions, after all, are driven by ethical concerns, or, as Levinas puts it, the "philosophical problem understood as the meaning of the human, as the search for the famous 'meaning of life'-- about which the Russian novelists ceaselessly wonder. "4 Furthermore, one finds in both a distinct trepidation about the ethics of aesthetic activity-- from the biblical prohibition against graven images and the Jewish modernist critique of representational art, to Gogol and Tolstoy's repudiation of their own fiction (and indeed of any art unmoored from moral education) and Dostoevsky's anxiety about negative beauty (Dmitri Karamazov's talk of the "beauty of Sodom" and Ivan's of the "artistic cruelty" of Turkish soldiers in the Balkans). Given such correlations, it seems surprising that, until recently, the topic of Judaism and Jews in Russian literature has been preoccupied with a fairly primitive test: Is this Russian author Judeophobic or Judeophilic? Or how did the author really feel about Jews? This book reflects the emergence of a relatively new effort to examine more deeply the interconnections between Russian and Jewish culture and thought, while avoiding the distortions of apologetics.5 Unlike many of the scholars involved in this effort, I am less concerned with the construction of Jewish or Russian identity, per se, than I am with what these interconnections can teach us about ethics and aesthetics--two broad and tensely intertwined terms for how we make value and meaning as we engage with the world. 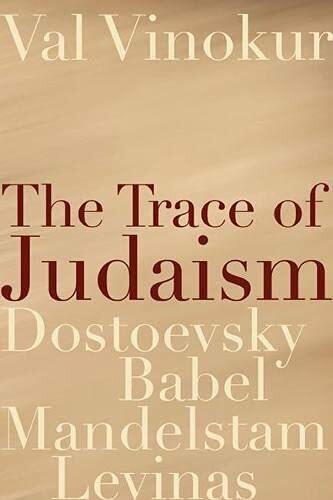 More specifically, I argue here that such Russian writers as Fyodor Dostoevsky, Isaac Babel, and Osip Mandelstam are profoundly involved with an ethical vision central to Jewish thought. I focus this argument by selecting Levinas, the Lithuanian born Franco-Jewish phenomenologist, as a philosophical evocation of this vision, not only because of his roots in Russian culture, but also because his idea of ethical nonreciprocity can claim partial Russian descent.6 At the same time, an examination of Levinas alongside Russian literature seeks to address and see beyond the current revisionism in Levinas studies, in which scholars have been disappointed in their attempts to extrapolate a coherent politics from his ethics.7 This book suggests that such incoherence may be understood in the context of the fundamental bipolarity in Russian culture--a tension between reality and utopia that is compellingly expressed in the authors considered here. Is it possible that Levinas's volatile mixture of philosophical messianism and Judaic moral realism, as Leora Batnitzky has described it, finds coherence not as theology, politics, or even philosophy but as literature--and particularly Russian literature, as a space in which the ethical and the aesthetic are so inextricably intertwined? If, according to Levinas, only the "I" (not institutions) can see "the tears that a civil servant cannot see: the tears of the Other,"8 then we must consider literature's role in the construction of this kind of ethical subjectivity.9 I wish to discover how the encounter with the other invokes responsibilities ethical and aesthetic: indeed, without aesthetic vision, ethics is blind and inert; without ethics, aesthetic activity reduces the other to an object of my pleasure or contemplation.